The grass along the banks of the Rio Darro hung tall and still under the roasting midday sun. Below the dipping reeds the water flowed crystal clear without hint of turbulence, like air with the viscosity of motor oil. A group of orange and white cats passively surveyed the river from under the drooping stalks along the bank. They lived as if in a vacuum free of responsibility, no place to be, nobody to please. 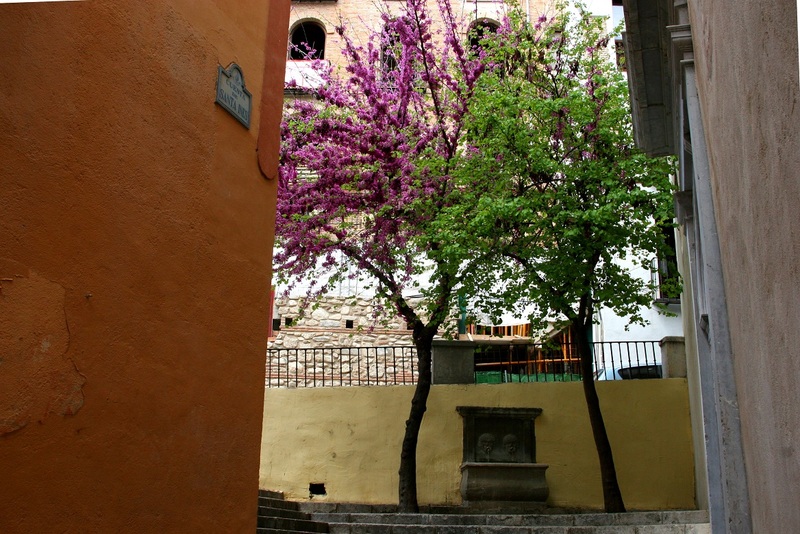 The lethargy that underscored their daily affairs was a natural defense against Granada’s heat. The locals knew this as well as the cats, and they responded to the searing heat with a daily siesta within their whitewashed homes or in the shade of the jacarandas that grow along the rio. Above the grassy riverbank a pair of ancient stone retaining walls jutted upwards, enveloping the rio in a slot between the old town center and the Alhambra palace—the Moorish stone masterpiece adorned with arched windows and curly Arabic inscriptions, whose walls seemed to grow out of the earth creating a vertical extension of the finger of land extending down from the snow-capped Sierra Nevada range. On the wall above the river in the shadow of an imposing alder I sprawled my body out in a state of lethargic repose, my legs dangling lifelessly from the wall while my body absorbed the coolness of the rocks. Sheena leaned against a rock pillar at the end of the wall near my feet. I watched the cats, who in turn watched the clear water as it passed under an arched stone bridge. 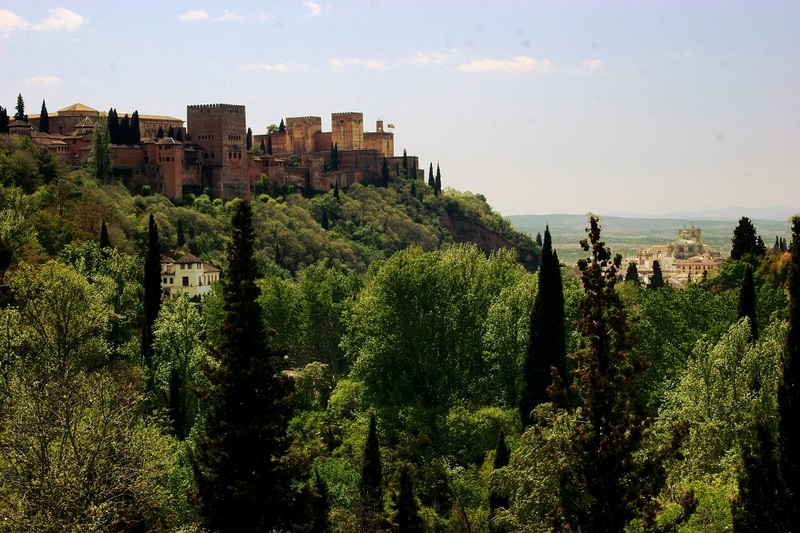 Standing opposite to the towering Alhambra to the South, the ancient whitewashed neighborhood called Albaicin extended up the hillside to the North in a web of tight cobbled lanes and winding stairways. A few feet away from us in the plaza at the base of the Albaicin a man played tremolos and rasgueados on his flamenco guitar, the nylon strings reverberating through planed spruce to fill the air with the sound which defines the spirit and history of Andalucía. 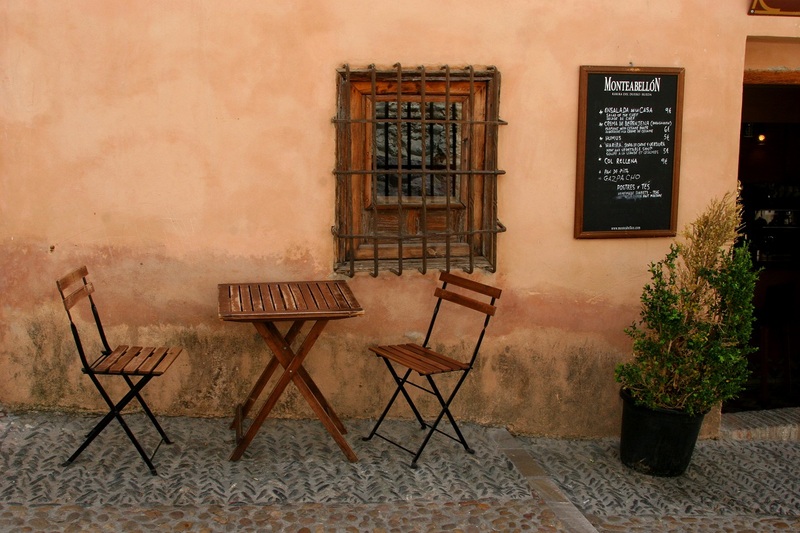 Men and women wearing light pants and skirts and sunglasses—the attire for a hot climate—relaxed in chairs under vine-covered trellises in the plaza sipping wine and casually eating olives, manchego, and slices of cured chorizo. 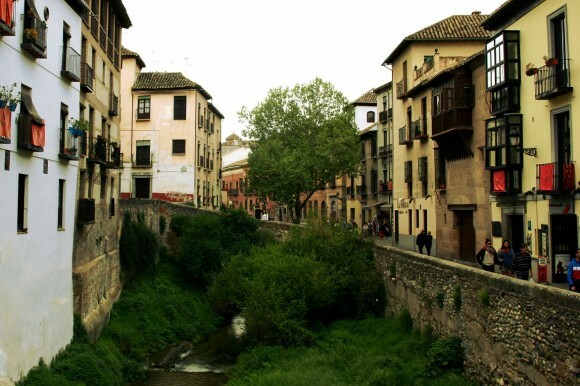 We left the plaza walking along the rio, and turned up a street toward the Alhambra. We passed shops selling postcards and decorative tiles, and several workshops where flamenco guitars have been manufactured continuously for centuries. Inside the men hunched over their workbenches tapping into place the frets which would one day be deftly manipulated by the city’s flamenco performers to produce the region’s haunting music, which in turn would be danced to in caves and bars, making Andalucia characteristically Andalucian. We circled back around to the bottom of the hill, stopping in a bar of varnished wood where old men watched fútbol on television, for a drink to temper the afternoon heat. We wandered out of the bar and up the hill on a small cobbled lane into the Moroccan district on the edge of the Albaicin. Men and women of a mocha complexion dove in and out of shops selling saffron and leather, while the smell of tea and flavored tobacco wafted from within the ubiquitous tea houses and hookah bars. A Moroccan man sat on a stool beside a board displaying various decorative paper sheets and a cup containing quill pens. We handed him one Euro and in exchange he wrote “Nacho” in Arabic calligraphy using a hawk feather; our little way of supporting a micro-entrepreneur. We left the Albaicin through the old city walls, wandering into the old gypsy quarter known as Sacromonte, where Gitanos had dug cave homes into the hillside hundreds of years ago. 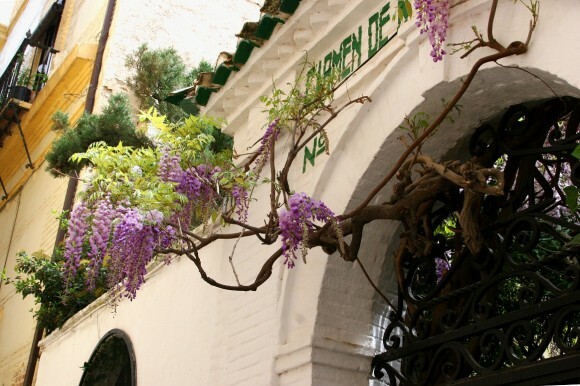 In Sacromonte there is a bar within a cave on the north side of the road opposite the alders and willows lining the Rio Darro. Outside of the bar under cover of an overhanging tarpaulin we took our seats at a table next to a man with his young daughter, perhaps eight years old. She had long, dark hair and in between sips of her juice, which she clung to with both hands, told her papá about all sorts of things in the squirrel voice that little Spanish girls have. Her name was Nina. The bar man walked outside to take our order. “Dos cañas, porfa,” I said. He nodded and addressed the girl and her papá. “Hola guapa,” he said to the girl, “algo mas para vos?” The girl shook her head and the bar man smiled and went back into the cave to retrieve our beer. While we waited an older woman approached from down the canyon and smiled at Nina. “Hola guapa!,” she said. Nina smiled as she sipped her juice through her straw, causing her dimples to momentarily grow deeper and her eyes to squint. The bar man emerged with our beer and tapas – a plate of cold meats with cheese, olives and bread. In Spain, a bar is the place to go for a light lunch. 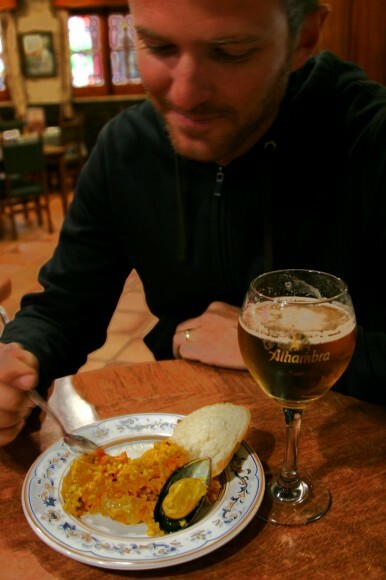 The cost of a draught beer is around two Euros, and with it always comes a free plate of tapas worth more than two Euros. How Spanish bars manage to make any money is a mystery, but it’s the way it has always been and hopefully the way it always will be. 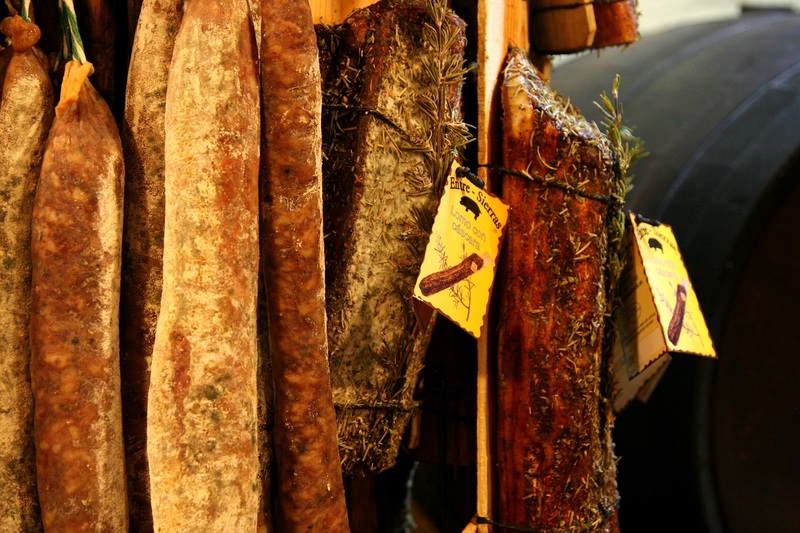 Why a culture of tapas emerged in Spain and not elsewhere I can’t say. 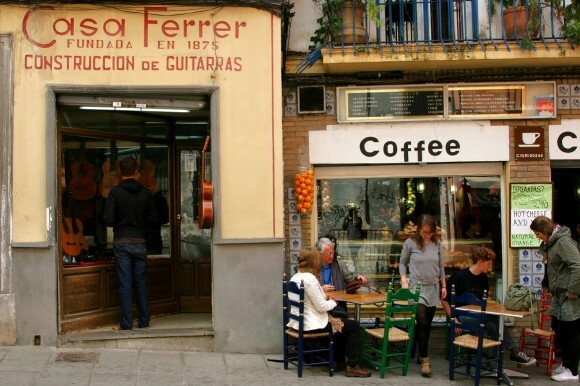 Long ago in Spanish bars, the barkeep would serve beer with a small plate placed atop the glass to keep flies out. At some point someone thought to place a small snack on the plate before serving the beer, not only keeping the flies at bay but providing something to snack on as well. “Tapa” literally means “cover,” and is so-called simply because they were originally used as a cover for the beer. Tapas are no longer served on top of the beer, but they are proudly delivered with every round; cold cuts, paella, bocadillos, chorizo sausage, fish, or any number of other dishes may be delivered with your drinks, gratis. Eventually we finished our beer and tapas and stood to leave. Just as we did so, an old man approached Nina and bent over to address her. “Hola guapa,” he said, smiling. Everyone in Sacromonte knows Nina. 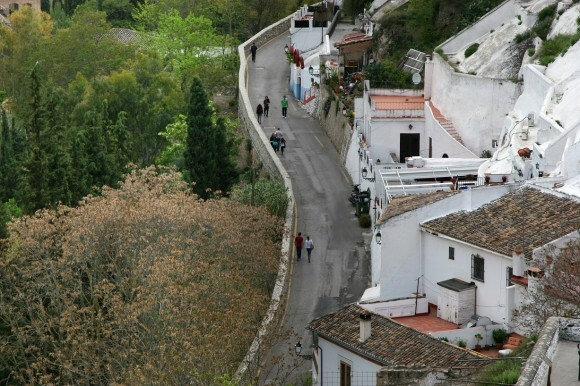 In the late afternoon we walked out past the caves of Sacromonte along the rio away from Granada. The sides of the narrow road were lined with sprawling agave plants, prickly pear, flowers and grass, and we caught periodic shade from the occasional overhanging tree branch. We had parked Nacho in a pullout carved into an embankment below a strand of agave, and when we arrived there I set up the shower. 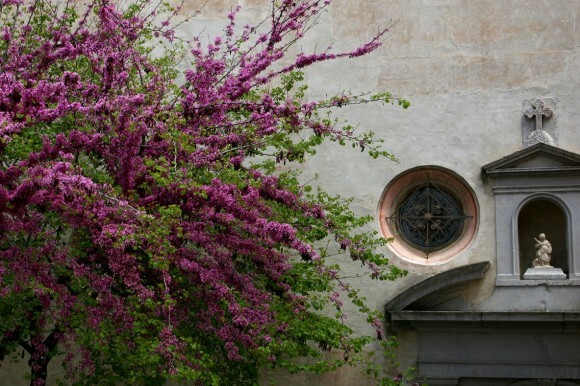 It was my thirty first birthday and we had made reservations at a flamenco show in Sacromonte. We took turns taking hot showers as the cool evening air settled in and then put on our best clothes, which after more than two years on the road were nearly indistinguishable from the clothes worn by Granada’s street gypsies. As evening settled in we ambled along the road through Sacromonte in the direction of the Albaicin. As we did, the slanting rays of the sun gave one last pass through the atmosphere and then dipped below the horizon, causing cool air to wash into the valley like water from the canyons that descended from the snow-capped Sierra Nevada. 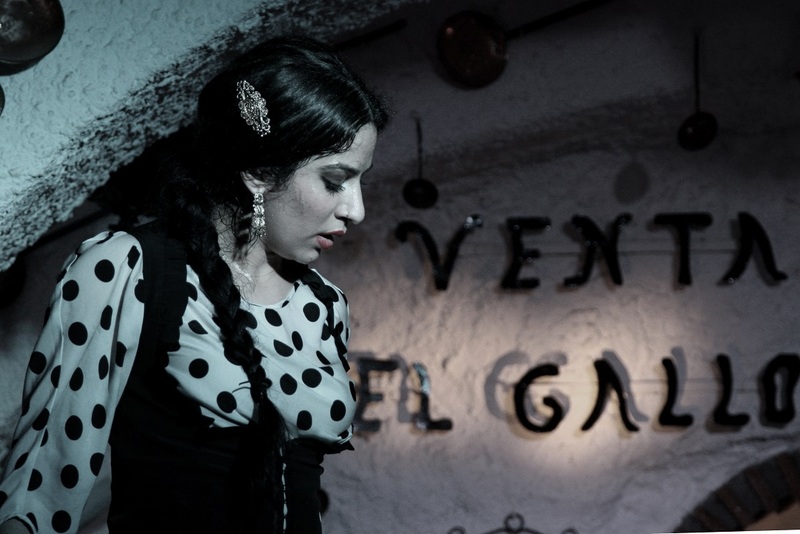 By the time we reached Venta El Gallo—a gypsy cave turned flamenco bar carved into a cliff wall—the air outside was cool enough to allow the wearing of long sleeves. Inside the small cave we found our seats near the wall among several rows of simple chairs. It was cool and dark inside and at the front a wooden stage had been constructed at the base of a wall decorated with hanging antique ladles and copper cups. An old street lamp illuminated the stage from within an arched recess in the wall. The roof of the cave traced a low arch all the way to the floor like a half-tube, its rough bulges having been whitewashed. The room filled quickly while a woman walked around filling glasses of sangria for everyone in attendance. Our heads soon became light from the wine while the air became increasingly heavy and warm from the collective exhalations of the waiting audience. The artists took their places at the front of the cave and at once smooth, rhythmic plucks of the flamenco guitar filled the air. The first among the group of three dancers—a young woman wearing a traditional black dress and polka-dot blouse—took her place at the stage front, staring intently straight ahead. Her dark eye shadow and red lipstick made her seem mysterious. At once her body snapped into motion, her arms writhing and twisting in the air as her feet stomped the wooden floor in time to the guitar and the chants of the two singers behind her. Her hips twisted to the music and her face strained with the effort to sustain the sewing machine tapping of her feet on the floor. She seemed to float in place as her feet moved faster and faster, her arms uncontrollably grasping at her dress until her face could no longer mask her intense concentration; her eyebrows flattened and her shiny lips became thin. The veins in her neck hardened and she struggled to keep her eyes open. The sound of her feet tapping the floor became a steady vibration and then her hands splayed open, leaving her dress wrinkled where she had held it in her small fist, and she began slapping her thighs and chest with her open hands, wincing at her own self-flagellation. At just about the time that it seemed she would explode into flames, she jerked her head back, stomped her feet one last time, and threw her arms into the air, her chest heaving, sweat dripping from her face, and her long black hair hanging in loose strands. She collapsed into her chair and the next dancer stood up. As we walked back home in the dark, the breeze carried a hint of agave and dry soil, made into perfume and whisked through the canyon by the currents of cool, moist air rising from the banks of the Rio Darro. OK, never mind. Still, a very nice piece of writing. Thanks, Steve. Actually there are typically two sizes of beer you can order when sitting at a Spanish bar: caña and jarra. A caña is the smallest size, typically around 300ml or so, and a jarra is a full pint. Sometimes it’s nice just to have a little beer in the middle of the day. jejeje “hola guapa” esa frase se usa en algunas partes de centro america… claro toda la herencia de el viejo continente. Bien me gusta lo que se ve. Leo muy poco en ingles y me cuesta entender todo ocupo un diccionario para traducir todo el texto, bien seria que publicaran con un traductor. Saludos desde Costa Rica. @Ernesto, estoy alegre que disfrutaste el blog. Quizas yo debo traducirlo desde Ingles a Espanol para mejorar mi Espanol y para permanecer conversante. Pero mientras tanto, tu puedes copiar y pegar todo el texto desde el blog a translate.google.com. Saludos! Hi Brad, wow this has got to be your best work yet. I could just feel, taste, hear and smell the atmosphere you crafted with your writing and photos. By the way, hows the next book coming along? Cant wait to get it when it comes out to read more of the adventures! Happy birthday Brad. Although very belated. At 31 you have already accomplished so much. You would make a great role model for young kids and it might be weird saying this, but I hope for my sons to have the drive and maturity that you have when they grow up! @Jacques, I’m glad you liked it – I was going for something a little different from the usual, and tried my best to describe Granada so that you’d know how it felt. As for the net book, we haven’t started writing the in-between tales yet, but will start as soon as we get home. I’m really excited about the tales left untold that we’ll get to tell in the book. @Karie, thanks so much for the kind words! Spain to soak in all in first hand. Thanks for the preview! If you make it to the Czech Republic, be certain to go to Cesky Krumlov!! 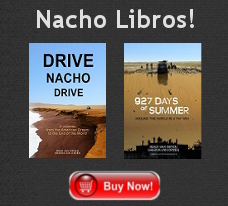 I was wanting to purchase your book for Apple iBooks? I can’t seem to find it, I only see Amazon Kindle version, and I don’t know if it will work on my iPad, and I don’t own a Kindle. Any help would be great, thanks!